If Starting with Corn on the Cob: Put your corn on the cob into cold water and bring, quickly, to a boil. Let the corn cook for 10 minutes (no more - the corn will soften some more when you add it to the soup). Set the corn aside to cool. If Starting with Canned or Frozen: If canned, drain your corn kernels well. If frozen, take corn out to thaw. Put 3 1/2 cups of milk into the small pot and set on medium-low heat to scald. When the milk foams, take the pot from the burner and set it aside. Don't let your milk burn. * Dice your potatoes into 3/8 to inch pieces and set it aside. * Dice the onion and set aside. * (If you've boiled corn on the cob) Cut the corn kernels away from the cob and set them, in a bowl, aside for use later. In the large pot, heat up the butter (3 tbs) and sautee the onion and flour (2 tbs) until the onion becomes shiny. Keep stirring this because flour burns quickly! When the onions are fully separated and glisten, add the (2 cups) water and the diced potatoes. Let the potato cook until they are softened. Add the scalded milk (less the skin that forms on the surface) and the corn. Let cook for an additional 5 minutes. Salt and pepper this soup very conservatively. You can alway add salt and pepper at the table but once it is in the pot you can't take it out. Adjust your salt if you've used salted butter. This soup is, while hearty, delicate in its balance of flavour. It is very easy to over spice. Try substituting the corn kernels with about 2 cups of clams - should be great (Beware, canned clams could be too soft)! Don't forget - use the water from the clams (and reduce the milk proportionately). 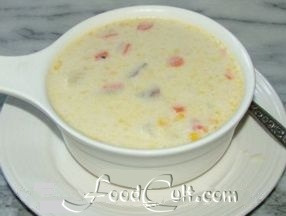 Corn chowder is a delicious, hearty, naturally corn sweetened, milk-based soup loaded with potatoes and sweet, plump kernels of corn - delicately flavoured with sauteed onion. It isn't a difficult dish to make but it does require some time and effort. We enjoy adding diced carrot to this soup. We prefer to use "peaches & cream" corn but any sweet corn will do nicely. You can use any corn kernels (canned, fresh cut off the cob or frozen) you wish. We use "off the cob" when we can get it organic - in season. We usually use frozen, though, as it is readly available as organic.